Heavy Duty Aluminum Shutters These sturdy aluminum shutters are the most efficient on the market. As fans are operational, the weighted louvers draw open by gravity and close when fans turn off. The aluminum construction makes them light weight and easy to install, yet can withstand years of continuous use. Each shutter comes complete with necessary hardware and easy to install instructions. The unique design of the shutters interlocking blades prevent drafts or back pressure and assures maximum seal when closed. Blades are .025 aluminum with double thickness on the top and bottom for added strength. Reinforcing brackets riveted to both ends of the blades along with stiffening ridges incorporated into the blade design provide additional rigidity. All pivot points are sleeved with a specially formulated cup-type nylon bearing which provides self lubrication and greater temperature stability. 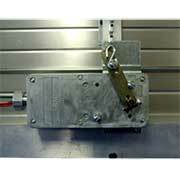 Frame is constructed of heavy aluminum extrusions with 1/2" channel lock water stop and precision mitered corners.